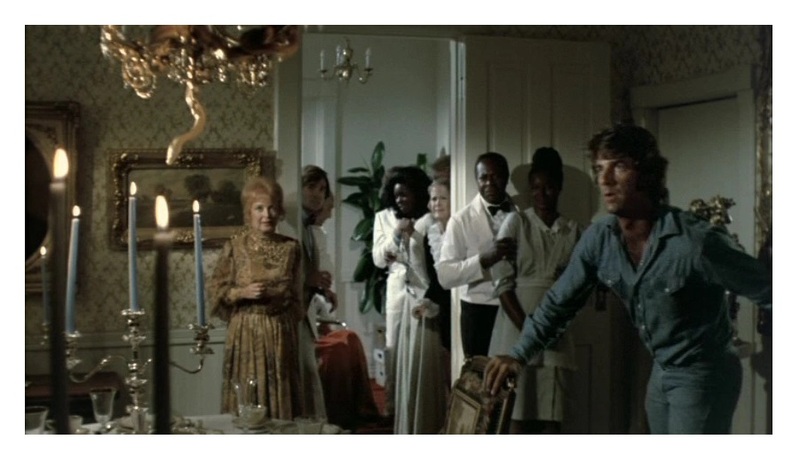 While investigating the effects of pollution in the Florida swamps, an environmental photographer, Pickett Smith (Sam Elliott, Road House), is invited to the birthday party of a crippled millionaire, Jason Crockett (Ray Milland, The Lost Weekend), who rules his brood with an iron fist. Pickett finds out that Crockett is deliberately poisoning the swamps and that the wild life is ready to fight back. 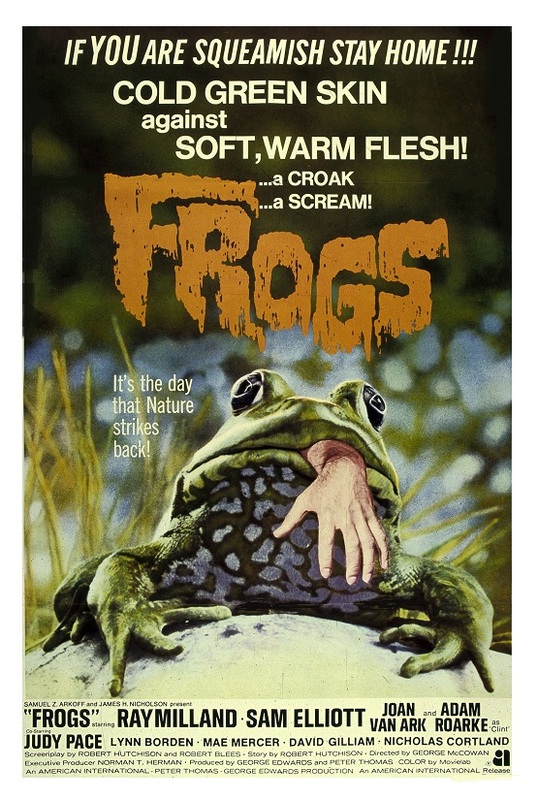 Who could ever forget the misleading poster with a hand coming out of a toad’s mouth? I was a kid when Frogs came out and I remember being anxious to see a giant toad eat a human being. I’m still waiting! Talk about false and misleading advertising — you should never lie to a child eager to see a little bit of mayhem. Seriously, I would describe this AIP (American International Pictures) production as “Tennessee-Williams-meets-Roger-Corman,” and therein lies the film’s main problem — this supposedly scary movie is more drama than horror. Too talky for fans of the gruesome, and too hideous for regular viewers. Never mind that, I found myself giggling a lot during the movie. 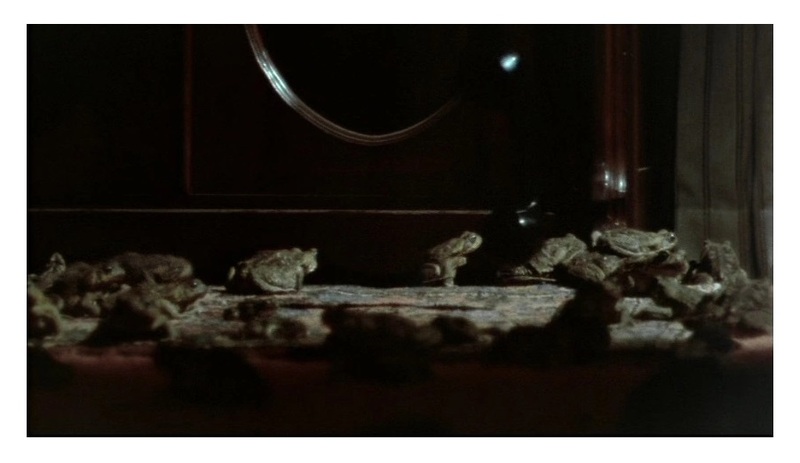 Frogs, directed by George McCowan (Shadow of the Hawk), is actually pretty atmospheric — cinematographer Mario Tosi captures the forbidden beauty of the bayou quite well — and believe it or not, the movie does have a rather charming pro-environment vibe that ties all components together. The cast is really good. It was a delightful surprise to see many familiar faces appear throughout the movie. Milland’s cantankerous Big Daddy (“I still believe man is master of the world”) is a hoot. Elliott, minus the famous bushy mustache, was still going through his “hipster-beefcake” phase. It will take him a few more years before he found his stride as a rugged individualist in westerns and action movies. I grew up watching Knots Landing, so I remember Joan Van Ark with affection. Here she plays Elliott’s love interest. Most interesting is the casting of Judy Pace, who plays a no-nonsense African-American model — a surprising and welcome smidgen of forward-thinking. I can’t deny it, I enjoyed revisiting Frogs. Called it childhood nostalgia, but I genuinely thought this was a fun piece of schlock with a potent social message and a few hilariously cruel murder set-pieces. Color, 91 minutes, Rated PG. Let's Go to the Movies!! !